The Cincinnati Bengals Monday announced the hire of Los Angeles Rams quarterbacks coach Zac Taylor as their head coach. 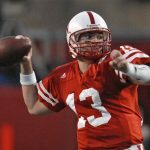 The 35-year-old Taylor was the 2006 Big 12 offensive player of the year as a senior quarterback for Nebraska. Taylor has been with the Rams since 2017, when he was hired as an assistant wide receivers coach before his promotion to quarterbacks this coach season. Taylor is the first Husker in the Super Bowl era to become an NFL head coach, and just the fifth former Nebraska player to lead an NFL team.